I spent last weekend in Seattle at KidLitCon and had a fabulous time! KidLitCon is an annual gathering of bloggers who specialize in children’s books. I went when it was in Washington, DC in 09, and loved it. Last year, it was the same weekend as the Horn Book Colloquium at Simmons, and that was closer, so I went to Boston instead, and got to be a fangirl meeting Megan Whalen Turner. 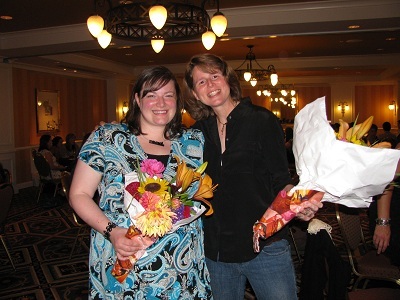 But this year, especially when I heard it would be in Seattle, I wanted to go to KidLitCon again. What did I take away from KidLitCon? KidLitCon is the friendliest conference you could ever hope to attend. I figure it’s because almost no one who attends blogs for their job — they do this because they love it. So you’ve automatically got about a hundred people who love what you do. Definitely a bunch of kindred spirits! This year, there was a special connection for me. You see, seven years ago, I posted a review of The Hollow Kingdom, by Clare Dunkle. Clare also lived in Germany at the time, and she got in touch with me, and we became friends. Clare was the one who put me in touch with Farida Dowler. Sure enough, our reading tastes made us friends and we became e-mail buddies. Later, when my marriage was falling apart, I needed friends to talk to about it who didn’t know my husband, so I could say all I needed to say without hurting his reputation. Farida provided a kind and helpful ear, and over the years I came to think of her as a dear friend. 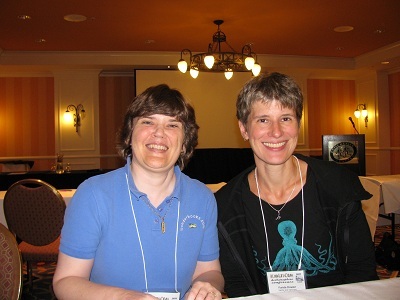 So, at KidLitCon, I finally met her! Some other lovely connection moments were meeting my roommate, Lisa Song of Reads for Keeps (we’d worked out the arrangements via e-mail, and she ended up being delightful); having a spontaneous dinner with Dorine White of The Write Path; and finishing off the conference with breakfast with Liz Burns, of A Chair, a Fireplace, and a Tea Cozy, whom I first met at KidLitCon09, and saw again at two ALA conferences. But that doesn’t mention all the many interactions with so many wonderful and friendly people. From start to finish, KidLitCon is the perfect place to meet people who love what you love and are happy to meet you, too. Above are Lisa Song, Melissa Fox, Maureen Kearney, Liz Burns, and me. 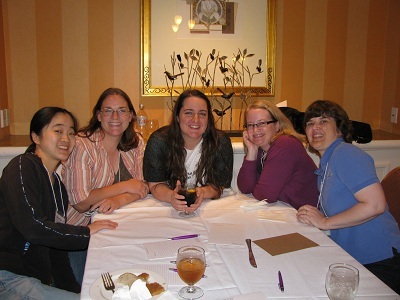 Let me repeat that the people I met at KidLitCon (including the ones I didn’t get pictures of) are fantastic people! Passionate about books and reading and literacy and libraries, and just a wonderful community to be part of. What else did I get out of KidLitCon? A lot of the panels were about doing what I believe I’m already doing: Blogging about both old and new books; writing reviews that tell why I reacted a certain way to a book; trying to do good with my blog. These panels were inspirational, and gave me additional ideas to do what I do even better. They rekindled my excitement about being a book blogger. Chris Singer of Book Dads reminded us that the books you choose to review can make a difference. The panel with Maureen Kearney, Melissa Fox, and Jen Robinson encouraged that blogging a variety of types of books can keep your passion alive. The panel on Critical Reviews, with Kelly Jensen, Abby Johnson, Julia Riley, and Janssen Brandshaw, gave us some nice tools of things to look at when analyzing why a book worked or didn’t work for you. Richard Jesse Watson talked about using your blog to play, to express yourself. He said, “Isn’t blogging like yodeling into the abyss?” He also said that play is one of the most important ways to rejuvenate your voice. He left me inspired to have fun with blogging and try new things. Friday night, we met a whole bunch of Seattle-area authors, as they got to talk for 90 seconds about their latest book. Of course my to-be-read list just got longer. In the panel “Moving Beyond Google Reader,” Jen Robinson gave some good instruction about how to set up a weekly or biweekly newsletter with your blog. Since that’s how Sonderbooks started, I definitely plan to follow her instructions to get back to that. And the final panel, “Prejudice and Pride,” on Diversity, was simply amazing in all the good stuff that came out. 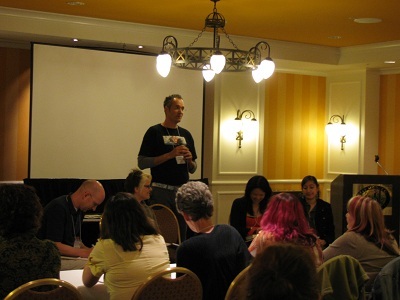 In the picture are Brent Hartinger, Sara Ryan, moderator Lee Wind, Justina Chen, and Sarah Stevenson. More than one author pointed out that the more stories there are about a group, the less tense people get. So the solution: Let more stories be told! Also, we do need a certain distance from a topic, so sometimes people NOT in a particular group can tell a story better. So, that begins to tell you how wonderful KidLitCon was. I never would have gone if I’d realized I’d be recovering from a stroke, but I’m so glad I did! And it did not solve my problem of needing more sleep, and so getting way behind on blogging. However, it did remind me how much I love blogging and books and bloggers and book people. And it reminded me I’m doing it for fun, but I am also doing good while I’m at it. Thank you so much, ladies, for planning a weekend I will never forget! This entry was posted on Wednesday, September 21st, 2011 at 10:25 pm and is filed under General, Kidlitosphere. You can follow any responses to this entry through the RSS 2.0 feed. You can leave a response, or trackback from your own site.